Definition at line 137 of file mainframe.h. Definition at line 143 of file mainframe.h. Definition at line 1332 of file mainframe.cpp. Definition at line 1522 of file mainframe.cpp. Definition at line 1342 of file mainframe.cpp. Referenced by StartMenuHandler::Command(), MainFrameBase::Create(), Create(), and MainFrameBase::OpenShellFolders(). Definition at line 1368 of file mainframe.cpp. Definition at line 1352 of file mainframe.cpp. Definition at line 1645 of file mainframe.cpp. Definition at line 1665 of file mainframe.cpp. Referenced by Create(), and WndProc(). Definition at line 1679 of file mainframe.cpp. Definition at line 1577 of file mainframe.cpp. Referenced by entry_selected(), resize_frame(), and WndProc(). Definition at line 1536 of file mainframe.cpp. Referenced by update_clnt_rect(), update_shell_browser(), and WndProc(). Definition at line 1656 of file mainframe.cpp. Definition at line 1598 of file mainframe.cpp. Definition at line 1605 of file mainframe.cpp. Definition at line 1384 of file mainframe.cpp. Definition at line 163 of file mainframe.h. Referenced by resize_children(), and resize_frame(). Definition at line 162 of file mainframe.h. Referenced by SDIMainFrame(), and WndProc(). Definition at line 154 of file mainframe.h. Referenced by entry_selected(), resize_children(), update_shell_browser(), and WndProc(). Definition at line 155 of file mainframe.h. Referenced by resize_children(), update_shell_browser(), and WndProc(). Definition at line 152 of file mainframe.h. 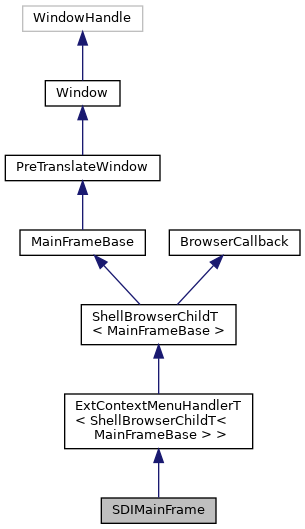 Referenced by jump_to(), update_shell_browser(), and WndProc(). Definition at line 161 of file mainframe.h. Referenced by resize_children(), SDIMainFrame(), update_shell_browser(), and WndProc(). Definition at line 165 of file mainframe.h. Referenced by Command(), and set_url().